Researchers Daniel Humphrey, Julie Marsh, center, and Julia Koppich present findings of their study of second-year LCAPs, which took effect on July 1. A team of researchers found that, two years into the state’s new school financing law, “nagging concerns” are tempering the enthusiasm that school districts and county offices of education have for the Local Control Funding Formula. The researchers – Julia Koppich, president of Koppich & Associates, Julie Marsh, a professor at the University of Southern California and Daniel Humphrey, an independent consultant – discussed their preliminary findings Friday at an event in Sacramento sponsored by Policy Analysis for Public Education, or PACE. Following up on an initial analysis a year ago, they and a team from several think tanks and universities based their new findings on a review of 50 second-year LCAPs, the planning documents that districts must create and update annually; an in-depth analysis of seven to nine districts’ efforts; and interviews, over two years, with 226 district and county office leaders, parents, teachers, school board members and community organizers. The LCAPs took effect July 1. No one, Koppich said, pines for a return to state funding dictates under the former system, or wants to relinquish control over budgeting and planning. District officials see benefits from engaging the community, a core element of the LCAP process. But the researchers concluded that old habits of mind die slowly. District and county officials trained in complying with state rules have little experience in long-range, creative thinking; the researchers said they saw few districts involved in true strategic planning. A “mindset shift” will take time, Marsh said, noting that one county leader expressed a hope to become more than an “L-cop” of the LCAP. But district and county officials also told researchers they worry that the additional state money they’ve received in the past few years will not be sustained, that a teacher shortage on the horizon will become a consuming challenge and that the help that the state has promised through a new state agency will not materialize. That agency, the California Collaborative for Educational Excellence, with a small staff and budget, is charged with guiding districts’ efforts to improve and will intervene if districts are persistently struggling. Mixed success on engagement: Some districts made a concerted effort to involve parents and the public with surveys, meetings and information translated to languages other than English; some districts have hired full-time community outreach staff or partnered with community groups to reach out to parents. But they also found generally a small turnout for meetings and a low return rate of surveys. In other districts, engagement diminished, perhaps by design, since districts assumed an LCAP update, due a year after the LCAP’s creation, required less participation, Marsh said. A poll last summer sponsored by Policy Analysis for California Education found that two-thirds of registered voters hadn’t heard of the Local Control Funding Formula, a larger percentage than a year earlier. Advocacy increases: In some districts, teachers unions seeking a larger share of funding dollars collided with wealthy parents asking for more Advanced Placement courses and groups like the American Civil Liberties Union, which advocate for low-income students and underserved minorities. Reflecting these “adversarial relations,” some LCAPs have incorporated what “the loudest voices” want, at the expense of a more coherent vision, Marsh said. LCAP complaints: The state board adopted the final LCAP template and regulations a year ago, but the researchers found some district officials still weren’t sufficiently clear about the purpose of the LCAP, and some were confused over what funding to include in it. Despite continuing efforts by the county superintendents association to strive for consistency in oversight, districts complained about conflicting and contradictory interpretations of the regulations. 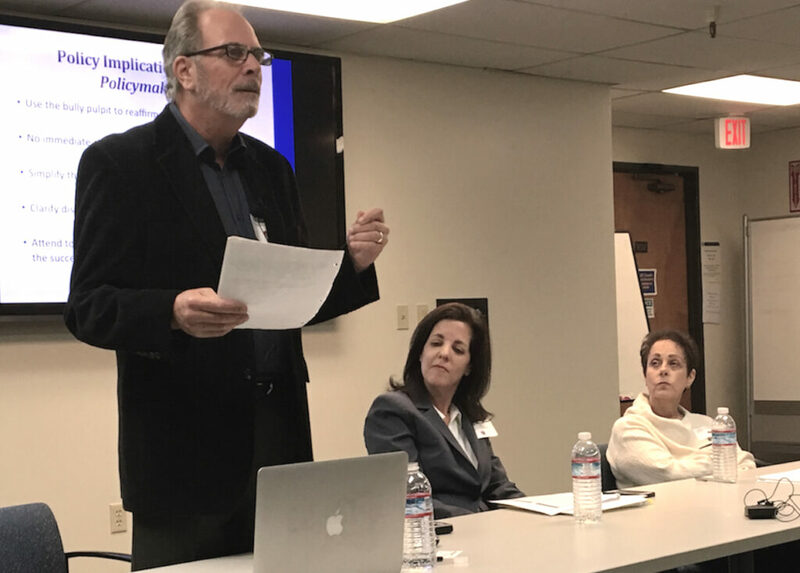 They found universal frustration with the LCAP template, which district leaders described as “unwieldy,” a “nuisance,” “self-defeating” and a “beast of documents” that does not allow districts to tell their story in a fashion people can read, Koppich said. In the LCAP’s second year, many districts’ LCAPs were hundreds of pages: a record 853 pages in one case, she said. The annual update section became an exercise of “cutting and pasting” material from the year before – not a thoughtful revision. “One superintendent said he had to provide CliffsNotes to principals to understand” the LCAP, Koppich related. And yet the researchers found that district and county officials agreed to leave the form alone, at least for now, out of apprehension they’d have to relearn a different approach. Humphrey said that in the final report they would recommend that the state board start now to simplify the LCAP’s requirements and to reduce the burden on districts. The state board also should clarify options that districts already have, such as including executive summaries with the LCAPs. “Many districts are waiting around for the state to tell them what to do,” Humphrey said. “That’s a great question,” Humphrey replied. 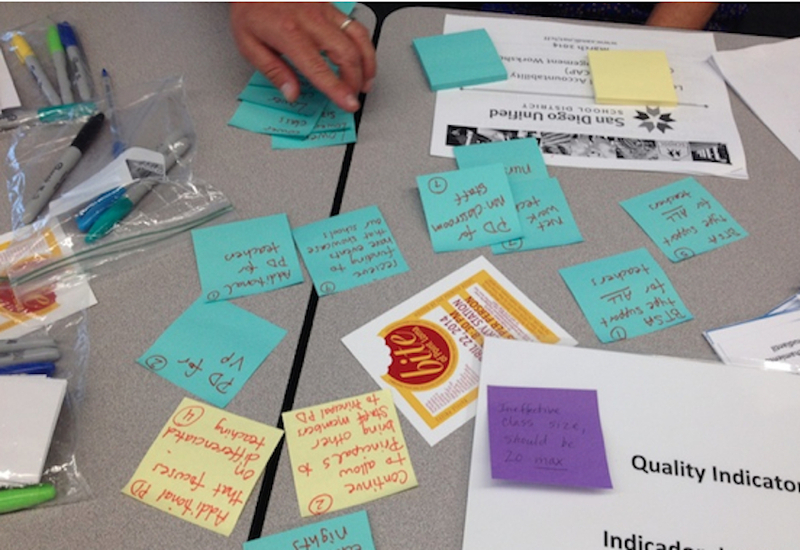 Paying more attention to districts’ ability to improve core operations. Efforts to create highly functioning human resource departments and effective data systems don’t get credit in the LCAP’s metrics, but are essential to improvement, they said. Teacher shortages tend to be concentrated in highest needs districts, Humphrey said. “If you have a weak HR department, you are in real trouble competing with strong ones next door,” he said. Advocating for school board members to play a more active role in the LCAP. There is a sense in some districts, Marsh said, that school boards are “defenders of the status quo.” They could play a mediating role among interest groups, and use data to help educate people about their districts’ problems, they said. Encouraging districts to gradually transfer spending decisions to school sites, where parents focus their attention and involvement.